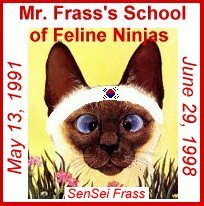 This Crazy For Cats site is owned by Noisy Bosse's Page. Wanna join this ring too? Jag jobbar som Ringmaster för den här webringen! Jättekul. This"Furrballs on the Net" site is owned by Bosse. Want to join the Pets Who Know HTML webring? This Bark & Meow site owned by BOSSE. This Cat's Meow Ring site is owned by Bosse. Den här sidan i Elsas Kattring tillhör Bosse.